The Schumann resonance has skyrocketed in the past couple of months, and researchers can’t seem to find a solid reason for why this is happening. Is the New Earth shift happening faster than previously anticipated? There’s so much happening this century, and people all across the world are beginning to feel these changes. A great transition is at bay, and it involves not only us, humans, but our entire home-planet. The Earth itself has a heartbeat. It’s called the “Schumann Resonance” and it has enveloped all living beings in a natural and steady frequency, pulsating at exactly 7.83 Hz for thousands of years. For the ancient Indian Rishis, this number bore a special meaning, as it identified with the frequency of OM – the sacred, cosmic sound in the Hindu religion. As you’re about to see, it now bears a special meaning to all those who are becoming aware of this undergoing great shift. For the Western world, the Schumann resonance represents the frequency of the electromagnetic field of the earth. It has steadily throbbed at 7.83 Hz with very few variations ever since it had been predicted in 1952. It all changed on June 2014 when the Russian Space Observatory System displayed a sudden increase in activity, with a spike stretching to 8.5 Hz, and even reaching to 16.5 Hz in some other days. Researchers were indeed baffled by this abnormality that had never before been recorded, and were unsure how to interpret it. Stacking on top of this dilemma, other unusual spikes have recently been detected, surprisingly rising to over 30 Hz, way above the milestone established in 2014. So, what to make of this considerable jump in Schumann’s resonances? What researchers can mutually agree upon is that those shifts clearly mean change of some sort. It is now believed that humans, who have been residing into a latent state for thousands of years, are now waking up to a greater reality where thoughts will materialize close to an instant. The Schumann resonance and the shift that’s been happening in recent years is among the best proof we have of this change. It has long been suspected that humans acting on a “collective consciousness” level can impact the magnetic field structure and create disturbances in it, such as the spikes recently detected. This usually is amplified during moments of high anxiety, passion or tension. This speculation is based on the fact that the Schumann frequency is “in tune” with the human brain states alpha and theta. These rising resonances naturally correspond to human brainwave activity, meaning that if Mother Earth is adjusting her vibration frequency, we may be doing it also due to our earthly bond. Another thing to have in mind is the acceleration of time that has been felt by an increasing number of people lately. Since the planet is pulsating in a more alert rhythm, it could also mean that this has repercussions on time itself, speeding it up. So why do we feel as though time passes faster than usual? The reason is apparently tied to the speeding of the Schumann resonance that’s making us perceive a 24 hour period as roughly 16 hours. We know that “Earth’s heartbeat” is accelerating, and after thousands of years with a rigid notion of time, where a full day numbered 24 hours, the accelerated “beat rate” of the Earth is making us perceive just two thirds of that amount, due to our own unconscious adjustment to this new age frequency. Time is not the only notion speeding up. We now have free access to information, one of our most important assets, and there’s a great increase in awareness worldwide because of this. Humans are becoming more spiritually and mentally aware than ever before, and reaching this status only takes years or even months now, because free information is found in abundance. On the other hand, researcher’s have reported that Earth’s magnetic field, a component interrelated with the Schumann Resonance, has slowly been depleting for the last 2,000 years, and at an even more accelerated pace lately. Nobody is able to provide an accurate explanation for it, but an article describing the wisdom of an old sage from India alludes to a possible cause. With this in mind, maybe we are indeed a species with amnesia that’s slowly going through a spiritual and cognitive renaissance that’s ought to deliver us the heritage of our forefathers. It’s true that waking up to this coexisting reality would turn our entire culture upside down, making way for new and improved concepts of history and life in general. Experiencing this shift will be truly challenging for most of us, but the road is already battered and the benefits we shall encounter at the end of this journey seem to be (at least in theory) extremely satisfying. So, better raise your frequencies to become more “in tune” with the New Earth. Better not miss this chance, as it might be the only opportunity to embrace the next stage of evolution before another cycle in Earth’s history breaks loose. Here's the link to the monitor. (Stillness in the Storm Editor) Iona Miller wrote the following extensive research paper discussing the infamous Schumann Resonance. While it might be challenging to review this kind information, I highly recommend doing so because it will provide the essential first-hand knowledge needed to understand the energetic nature of existence. There is one thread to this paper that will likely be controversial, which is that the Schumann Resonance is not rising, as many have suggested for decades. However, before reacting to that statement, please take the time to understand the evidence at hand and know that the general principle of energetic shifting is still valid, as I will attempt to explain. There are numerous images of Schuman Resonance readings circulating the internet that are cited as examples of it rising. In order to understand what is represented in these graphs, we’ll briefly discuss the Schumann Resonance and how it is produced. The space in between the surface of the earth and the ionosphere, an approximately 50- to 375-mile thick layer of non-luminous plasma or charged atmospheric gas, forms an electromagnetic resonant cavity, with a potential resonant frequency range known as the Schumann Resonances. This is also known as the earth-ionosphere waveguide system. 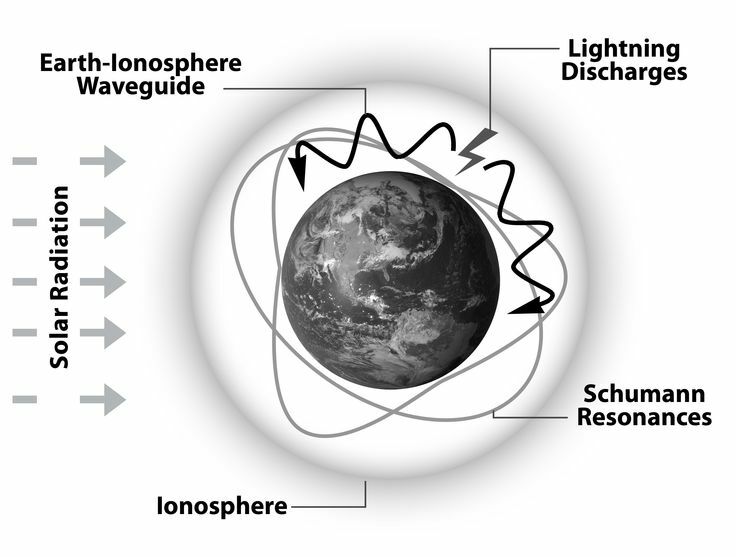 Lightning is the most common source of energy for what is known as exciting the Schuman Resonances because it acts like an antenna, radiating pulses of electromagnetic energy in the extremely low-frequency range that is resonant with the ionosphere. It moves outwardly along the earth’s surface and atmosphere like a pebble hitting a pond. This rings the cavity like a bell, which appears as excitation pulses (energy blips) on monitoring stations or a continuous line for longer spans of time. Much like the sound of a loud guitar plugged into an amplifier rings a snare drum nearby, or a loud sound in a house that shakes the windows, or the sound of an echo in a valley or canyon, the atmosphere “rings like a bell” when it is excited, but the ringing is electromagnetic, instead of sonic. The resonant cavity itself—the physical space between the surface of the earth and the ionosphere—creates the Schumann Resonances, an electromagnetic spectrum or scale. The only way to change this frequency range is to change the size of the earth itself or the ionosphere—but these two factors remain fairly constant over time, which means that the baseline resonances themselves do not change. However, the cavity is not perfect, and there are various factors that can alter the ionosphere’s size and shape, which have a small effect on the frequencies in the scale. The Schumann Resonances are a series of potentiated frequencies, with a baseline of 7.83 Hz, ascending in harmonic progression up the electromagnetic range to 14.3, 20.8, 27.3 and 33.8 Hz—the first four modes. The higher the Hz value, the shorter the wavelength and the more energy dense the waveform. A piano is a device that produces sound waves when a key is depressed on the keyboard, striking a string held in tension with a hammer. If no keys are depressed, the piano doesn’t make any sound—you can’t hear any of the notes—although they have the potential to make a sound. If the piano is at rest, when no one is playing, then all the frequencies that correspond to the keys are potentiated—they are there waiting to make a sound but haven’t been struck yet. The Schumann Resonances are similar in that each frequency band is “quiet” until something hits it, most often, lightning strikes. What does this have to do with the Schumann Resonance not rising? This is important because the thing we call the Schumann Resonance is a kind of “map” of what is happening in the atmosphere; it is a mathematically derived prediction that says when the atmosphere is struck, it should produce frequencies in a certain range. The Y axis represents frequency in Hz and the X axis is time. This is one of the many types of Schumann Resonance data sets that can be found online, but there are others as we’ll see below. Interpreting the graph, notice the bands marked MODE 1 through 4—these are the Schumann Resonances “ringing” as they are “struck” by lightning and other sources. Because the wavelengths are so long, as well as the imperfections of the resonant cavity, the lines in the graph are not well defined, more like hazy speed bumps. The 7.83 Hz value, is the most visible because it is the most excited or energized—the loudest. With this information in hand, you now have the ability to interpret Schumann Resonance graphs yourself. The bright patches in the graph correspond to energy intensity; the brighter the area, the more energy that is coming through. n this plot from the 13th of November, 2014, a large scale excitation event caused the four modes mentioned earlier (7.83,14.3, 20.8, 27.3 and 33.8 Hz) to spike in activity— the right-hand side of the graph. The “spike” in energy is some kind of excitation event, which energized frequency ranges all the way up to 32 Hz. The fact that the resonances were excited is what makes the spike appear in the graph; however, the Schumann Resonance scale (the potential set of frequencies) has not changed and this appears to be the source of the confusion. Side note: The white patches above are examples of the sensor used to gather the data being overloaded due to the intensity energy excitation event. This is similar to what happens when attempting to film the sun or a brightly lit object with a camera that isn’t capable of handling the light intensity, whiting out the image. The inference is that the baseline frequency of the Schuman Resonance spiked to 24 Hz, as marked by the red arrow. But this is not correct. Notice that all the Schumann Resonances of 7.83,14.3, 20.8, 27.3 and 33.8 Hz are excited and fall within the standard frequency range calculated by Schumann. What this means is that the Schumann Resonance range itself has not changed—the atmosphere was excited and it “rattled” the resonant cavity. So while the range itself did not shift up, the energy within the system did spike to a high level. And that will affect life on Earth. What else can excite the atmosphere and cause higher ranges to ring? Cosmic rays, coronal mass ejections, lunar cycles, the solar wind, and most strikingly, artificial EM sources like HAARP, all have the ability to excite the Schumann cavity to produce spikes in the higher ranges, as the below paper details with precision. What does this mean for the notion of energetic ascension and evolution? For those concerned, the good news is that the only thing this changes is your understanding of what is actually happening. Events themselves are still influencing us and doing what they do. The understanding of energetic evolution is dependent upon a comprehension of entrainment or sympathetic resonance. Our bodies are in harmony with the earth’s electromagnetic field and output, which is in turn, harmonic with the sun, which is in turn, harmonic with the galaxy, and so on. This means that literally the entire cosmos is playing a part in what happens here on Earth. What we can say with a high degree of certainty is that the energy pouring in from all sources is having a marked effect on our bodies and minds; this is unrefuted and confirmed in mainstream science. We also know that DNA is an antenna, receiving information via electromagnetic and scalar wave phenomenon that alters the behavior and expression of the body-mind system. Finally, solar and galactic cycles also play a major role in evolution, including human consciousness. And there is what NASA is calling “local fluff”—an energetic field that is influencing the solar system. All these data points—properly understood and contextualized—suggest the energetic broth that the earth is swimming in is changing. And via the concept of entrainment, we know that changing the information contained within a field alters the behavior of the things contained within. Thus, spikes in the Schumann Resonance signify that energy is entering the earth, and with it, information that will unquestionably play a role in evolution. I hope that this and what follows sheds new light and understanding on the often misunderstood topic of “rising Schumann Resonance” along with many other fascinating aspects of how what has been called the earth’s heartbeat plays a major role in our lives. There has been a spike in the power of the earth’s geomagnetic field affecting the schumann’s resonance: reaching a 15 month high. According to a real time graph from Heart Math there has been a spike in the earth’s geomagnetic field, the data only goes back 1 year, but I managed to find data going back to April 2016, meaning it could actually go back further than 15 months. Going back for the 15 months I have data for the there have been Schumann Resonances Power lows of 15 and highs of around 360. With the field for the most part sitting between 80 and 200 dependant on the location. In the last 10 days it reached a high of 538.83 in Alberta, Canada and then continued to fluctuate in the successive days, reaching a peak yesterday of 1006.6. Peaks have also been reached in California, Lithuania and New Zealand over this period. It is hard to say for certain what has caused this spike, but the geomagnetic field can be influenced by solar activity, the moon’s rotations and interplanetary activity. What Is The Geomagnetic Field? The Earth’s geomagnetic field is the magnetic field surrounding the planet that extends from the Earth’s core to outer space, where it comes into contact with solarwinds which are a stream of charged particles emanating from the Sun’s rays. The geomagnetic field has 2 poles (north and south) which are different from geographic poles and can shift as much as 55 kilometers every year. The geomagnetic field is vital for our survival and protects the earth’s atmosphere from otherwise catastrophic solar activity which would destroy the earth’s ozone layer. Many species of animals detect the Earth’s magnetic field and it is used for navigation when migrating. It has also been shown that cows and deer align themselves to the earth’s magnetic field when grazing. What Does This Flare Mean? When the earth’s magnetic field environment is disturbed it can cause sleep disturbance, mental confusion, unusual lack of energy or a feeling of being on edge or overwhelmed for no apparent reason. They are also investigating if changes in the earth’s magnetic fields happen before natural catastrophes such as earthquakes, volcanic eruptions and human initiated events such as- riots, social unrest and terror attacks. Solar activity has not only had negative affects of society, but has also been associated with collective growth and development such as architectural, artistic and scientific breakthroughs, as well as positive social change. It has also been hypothesized that there may be a link between both human consciousness and the geomagnetic field: meaning the frequency that we emit, could well affect the geomagnetic field, as much as it affects us. reating a field that is approximately 100 times stronger than that of the brain. With the right equipment the heart’s electromagnetic field can be detected several feet from the body. This is a big moment and only time will tell the affect it has on us collectively, but an understanding of an event can often help you to avert disaster. So stay conscious of your actions! Please share this article!